Netmarble Delivers More Robust Content to Blockbuster Mobile Action RPG. SEOUL, Korea (October 7, 2015) – MARVEL Future Fight, the blockbuster Mobile Action RPG from leading Korean gaming company, Netmarble Games, has released the newest update featuring brand new characters from Marvel’s Agents of S.H.I.E.L.D. 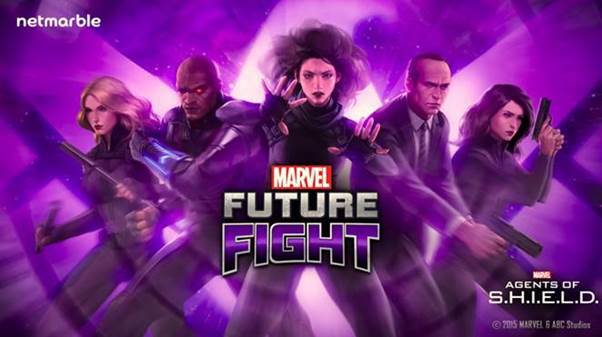 Coinciding with the season three launch of the hit ABC Television show, players will now be able to recruit notable agents such as leader Phil Coulson, Daisy Johnson (Skye), Bobbi Morse, Lincoln Campbell, Deathlok, Sif and a variety of other operatives on their teams. Non-stop action awaits as the world’s best agents are on-hand and ready to take action. In addition to brand new characters, players can now delve further into the world of Agents of S.H.I.E.L.D. with the inclusion of two brand new stages. Infiltrate Hydra’s Arctic Base and destroy all enemies in sight as the snowy obstacles may prove difficult. Opposite of the arctic environment, players can also explore a small settlement hidden in the mountains that serves as the sanctuary for the Inhumans that fans of the show may recall as the Afterlife. Famed Marvel Comics writer Peter David took part in the creation of MARVEL Future Fight, which features over 62 playable characters including Ant-Man, Iron Man, Thor, Spider-Man, Daredevil and heroes from Guardians of the Galaxy and Secret Wars. Players can build their own team of heroes to face off against villains such as Doctor Octopus or Ultron, all while enjoying gorgeous graphics and innovative controls. MARVEL Future Fight also features co-op for added support and action packed entertainment. MARVEL Future Fight has launched in 148 countries and has hit the Top 10 charts in 118 countries including Korea, Taiwan, the United States and the UK, while registering 20 million downloads in its first 2 months. MARVEL Future Fight has held its place at the top of both the App Store℠ and Google Play™ Store worldwide charts, landing overall at #6 for May 2015*. MARVEL Future Fight dominated the iPhone® games ranks, reaching #1 in daily downloads in over 40 countries including the United States, South Korea, and France. MARVEL Future Fight is available worldwide on the App Store and Google Play.